One of my favorite ways to learn about a new place is to go for a run there! Cuckoo for jogging maps, even trail running maps! 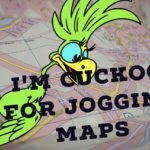 The Cuckoo for Jogging Maps feature is returning to Will Run For Miles!! Who doesn’t love a good jogging map? The suggested routes on this map for Lower Manhattan include paved walking/running routes that circle lower Manhattan. Very scenic and runner/walker friendly.